The Bear and the Nightingale is Katherine Arden’s debut novel from Del Ray Books. It may seem bold to say that this novel will be one of my top ten reads of 2017 (especially considering it was the novel I was reading as the new year began) but I am 100% confident that this will be one of the best books I read this year. I devoured every luscious page and adored the mixture of history and folklore. In the harsh Russian countryside, Vasilisa (Vasya) grows up refusing to fit in like the other girls. Instead of brushing her hair, she runs through the woods, instead of wanting to become a wife, she’d rather stay true to herself and be a spinster if necessary. Her father allows her to live as she pleases, probably because she was the last child to be born before his wife passed away (and the fact she ran too fast for anyone to catch). Brought up on fairy tales and folklore Vasilisa sees nothing strange in talking to the wood spirits and other creatures that protect her home and the village, oblivious to the fact that others cannot see them. When a new priest is brought to the village he crushes the villager’s traditions with fear and threats of damnation but as the village stops their offerings to the creatures that protect them, the creatures become dangerously weak just as an old evil is regaining its strength. If the words ‘fairy tale’ leave you imagining a twee, overtly happy land then please think again. While brimming with magic and wonder The Bear and the Nightingale also holds some incredibly dark moments, including a haunting chapter where the dead rise and come home begging for warmth and shelter. If like me, you have a love for the work of Neil Gaiman, or adored The Snow Child by Eowyn Ivey and The Gracekeepers by Kirsty Logan then this novel is utterly unmissable. Good fantasy has the ability to introduce you to new worlds, great fantasy immerses you in those worlds and leaves it under your skin like a perfect memory you want to return to again and again, this is exactly what The Bear and the Nightingale achieves. I’m over the moon that this is the first in a trilogy as I can’t wait to return to Vasya’s world. 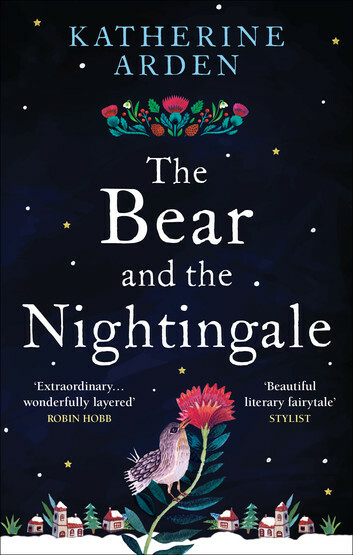 A huge thank you to the lovely Katherine Arden for taking the time out to answer a handful of questions I had about The Bear and the Nightingale. 1) What was your inspiration for The Bear and the Nightingale? I have loved Russian fairy tales from childhood on. When I was nineteen, I spent a gap year studying the Russian language at the Pushkin Institute in Moscow. When I returned to the US, I matriculated at Middlebury College, where I majored in French and Russian. Degree in hand, I moved out to Hawaii to work on a farm. Farm work is not the most exciting, so to entertain myself, I decided to write a book. Because of my love for Russian literature and for fairy stories, I already had a sense that I wanted to write a book set in Russia, and based on a fairy tale. But what really jump-started the storytelling was the family that lived on the farm next door to mine. They were Russians, doing a sort of working holiday. Their five-year-old daughter was with them. Her name was Vasilisa, and she was the coolest kid—wild, charming, clever. When I met her, I thought, well that girl should be in a book. I based my heroine on her and so The Bear and the Nightingale was born. 2) Do you have a favourite character in the book? Were they also the most enjoyable to write? My favourite character is definitely Vasya, my heroine. From my earliest days writing The Bear and the Nightingale, Vasya had an ethereal yet ferocious quality that I loved. She has such a strong sense of herself, yet she loves her family and will sacrifice for them. Writing her brought me back to my own childhood, but also let me find my way into a character who is quite different from me. I would love to be more like Vasya—sometimes when I have a dilemma I ask myself, what would Vasilisa do? Not to mention the fact that she is my only character who is specifically based on an actual person I knew. I really enjoyed writing the winter-king, because it was a challenge to get into his head, and I didn’t want him to swerve into cliché. Finally, I really enjoyed writing Konstantin the priest because he is such a brilliant, talented person, who uses his gifts in such terrible ways, but all the time thinks he is doing good. It was interesting to try and make that realistic. 3) If you could describe The Bear and the Nightingale in five words, what would they be? 4) Who is your perfect reader? Honestly, I don’t think there is such a thing. No two people read the same book, even if they are reading the exact same text. Even the SAME PERSON at different times in her life, might reread a book and get something totally different out of it. People interact with a book on different levels, and there is no right or wrong way to go about it. Certainly, it’s great when someone goes into transports of delight upon finishing my book—is that what is meant by a perfect reader? But sometimes it’s more interesting when someone didn’t like the book and takes the time to write a long, cogent review explaining why. One of the most interesting and informative conversations I ever had about The Bear and the Nightingale was with an old Russian professor of mine, who flat disliked my lightweight fantasy, but had so many intelligent things to say about it that I couldn’t really begrudge him his opinion. It’s fun hearing from Russians who have been hearing these fairy tales their whole lives, and it’s fun to hear from people who know nothing about Russian folklore. The way people take your book says more about them than it does about you. So I say bring on the readers! 5) The novel takes inspiration from traditional fairy tales, did you need to do much research on this style of story? I was already pretty familiar with the Russian fairy tales I wanted to use in my novel. I wasn’t too worried about riffing on the fairy tale structure—indeed I didn’t have a particular structure in mind until I actually finished my book and looked back to see what I had written. I did need to do lots of research on Russian history in the Middle Ages, and I also needed to do some research on Slavic folklore, especially household spirits, to be sure I was getting that right. 6) Do you have any habits or strict rules to help you write? Daily word counts, listening to music etc? When I’m drafting, 2k words a day is my thing. I started doing this after I read On Writing by Stephen King, but. 2k words come to about eight pages in my large notebook. I find my computer somewhat distracting, and I like the sense of—effort that goes into hand-writing. Also typing the pages into my computer is a chance to edit a bit as I go. I write five days a week and take weekends off. Sometimes I listen to music, sometimes not. I really like working in coffee shops. Ambient noise helps me concentrate (also perhaps caffeine). 7) What book changed your life? Well a series, but The Lymond Chronicles by Dorothy Dunnett. I was late to that party—I only read the first book, The Game of Kings, in my early twenties, but those books really brought it home for me how rich, how subtle and how brilliant a writer’s game can be. I am pretty sure that a lot of writers have those books as a personal touchstone. You read The Lymond Chronicles and every page gives you a new insight into what you can do with language, and with misdirection. They are books that, if you’re a writer, show you how it’s done. And they make you laugh and cry and swoon, and give you a giant book crush so that too. 8) What was the best book you read in 2016? I really enjoyed Eowyn Ivey’s To the Bright Edge of the World, TC Boyle’s Drop City, All the Light We Cannot See by Anthony Doerr and Station Eleven by Emily St. John Mandel. 9) Are there any books you are looking forward to reading in 2017 (new or old)? I can’t wait to read Margaret Rogerson’s An Enchantment of Ravens, and Heather Fawcett’s Even the Darkest Stars, both 2017 debuts. I also have The Passage trilogy standing on my shelf staring at me, and I can’t wait to read those. Also Julia Baird’s biography of Queen Victoria, Victoria, the Queen. Also, I don’t know if these will drop in 2017, but I (along with a large chunk of the reading public) am keen to get my hands George RR Martin’s The Winds of Winter and Hilary Mantel’s The Mirror and the Light. My taste in books is pretty eclectic, as you can see. 10) Do you have any other writing projects underway at the moment? I keep an idea list and am always adding to it. Some ideas I am actively working on, just to entertain myself and keep the sense of fun in writing. I have half of a horror novel drafted that involves a forest and a school bus. I have a lot of notes and sample chapters for a series about a magician in Renaissance France. Then I have an idea for a book set in the US northeast. Then…the list is endless. Starting projects is easy. Finishing them is harder. If you like this then you’ll love The Snow Child by Eowyn Ivey. Buy your copy of The Bear and the Nightingale from Amazon here. loved this review, Cara! and I agree with Katherine, Station Eleven was sooo good. highly recommend. I can’t wait for the final Winternight book. come on January!! Same here! I can’t wait to see how she finishes the story. I haven’t seen anything new mentioned from Emily St. John Mandel but I’ll keep my fingers crossed because I loved Station Eleven, the audiobook is great too.